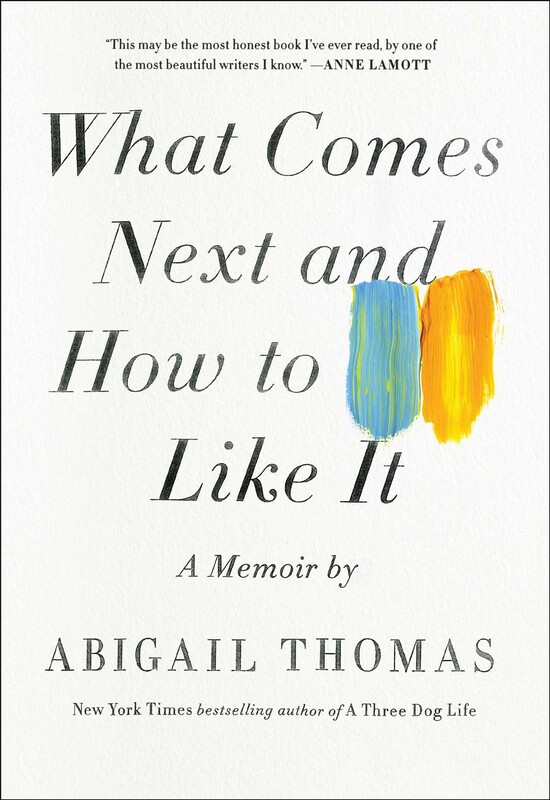 About one-third of the way into Abigail Thomas’s What Comes Next and How to Like It, the author has coffee with a woman who worries about the future. “I worry about what would happen if [my husband] got sick or I got sick, I worry how we would manage,” Thomas’s companion frets. She speculates that her future has shrunk, and when she wonders if other people worry about the same things, Thomas’s response is frank puzzlement: “I never think about the future at all,” she says. Thomas left the meeting feeling sorry for her companion, “a woman wasting a perfectly good afternoon worrying about something that might never happen.” Though she had to concede that the death part would eventually catch up to her, she was hard-pressed to get worked up about it. As she walked down 59th Street, the future receded, and Thomas let herself be drawn in by delight and spectacle: by the time she passed a splendid figure dressed entirely in gold, she had forgotten to even think about the future in favor of the present. Oh, New York, she thought, I love you so much. It wasn’t that Thomas hadn’t already faced her own share of devastating loss. She had: her beloved third husband, who was hit by a car, had sustained permanent brain damage and then died seven years later. But Thomas, who had years before raised four kids as a Solo Mom, distinguishes between worry and grief. As she writes, “I don’t worry about my husband, the worst that could happen to him already happened.” Life’s lessons have seemingly inured her to fears of mortality. What Comes Next and How to Like It, which traces an arc of decades, is about learning to navigate that dread. It’s also about what helps us do it. A memoir, necessarily, is about memory, though Thomas concedes that her own is riddled with inaccuracy. “Great chunks are falling away, like cliffs into the sea,” is how she describes memory loss, with characteristic self-deprecation. And that’s one of the great pleasures of this memoir: sometimes it reads like poetry. The chapters are spare but not slight: Thomas has a habit of sneaking up on you with revelations. She might be talking about her dogs one moment, but then comes the realization that what she’s really talking about is cancer, or alcoholism. Her epiphanies sneak up on the reader much the way they seem to have snuck up on Thomas herself. And much the way that aging, loss, and mortality sneak up on us all. If endurance seems to involve a certain acceptance, it also involves gratitude. “I have learned that to be witness to one another’s lives is the greatest of gifts,” Thomas writes near the end of the book. That witness might be profound: the birth of Thomas’s beloved grandchildren, for instance. But grace can also take prosaic forms. In one chapter Thomas, initially shocked when she stops by Catherine’s place and finds her daughter binge-watching the television series Supernatural at 10 o’clock in the morning, ends up sitting down on the couch, too, and not getting up again for hours. “It’s easy to find that five or six hours have sped by without my noticing,” she writes about watching the show. “I am having fun. This is not my world, these are not my fears. Supernatural is great storytelling, and it is not my story.” Best of all? It’s something she shares with a child she loves. “I know,” is his response. And maybe that’s the final takeaway. We can’t avoid pain; we can’t avoid loss and death. But, as Thomas writes, we can take pride—and joy—in the fact that we have endured in the company of those we love.